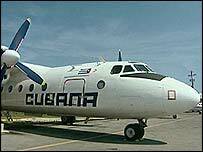 A plane used by a Cuban hijacker to get to the United States has gone for almost $60,000 on an internet auction site, according to the seller. Matthew Overton bought the Soviet-era aircraft for $6,500 (£3,986) through a government auction in Florida in June. He told Reuters that the Antonov-24 fetched $59,100 (£36,248) after a 10-day auction on the internet site Ebay. Proceeds from the initial sale of the plane were given directly to a Miami woman who successfully sued Fidel Castro's government for £27m. Ana Margarita Martinez took the unusual course of suing the Havana government after she learned her husband of less than a year was in fact a Cuban spy. The US decided the proceeds from the auction of three hijacked planes from the communist island would go towards her settlement - a decision viewed by some people as a worrying precedent. Mr Overton, a 25-year old pilot and auto mechanic from Greeley in Colorado, decided to put his recent acquisition up for sale after he failed to get it certified by the Federal Aviation Administration. "I really wanted to fly it," he said previously. "But it's one of those things. I can't do anything with it. I'm kind of stuck." He now plans to use it to pay off bills and become a flying instructor. The plane was used by Adelmis Wilson Gonzalez, 34, to fly from the communist island to the US in April. He was convicted by a Key West jury last week of air piracy and now faces 20 years to life in prison.